As a faithful donor and supporter of Cornerstone you have sowed into our past and present endeavors to impact life in the community. You have been a part of our mission to Share, Support, and Empower. Have you considered how you will impact our future, especially once you have passed on? 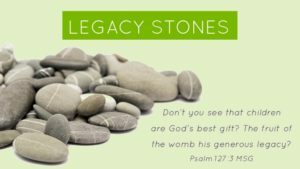 We invite you to become a part of Cornerstone Legacy Stones. This is a group of donors who have made a commitment to Cornerstone from their estate or future wealth. You would be sowing into our future financial stability and sustainability. It is a meaningful way to reflect and express your values and strengthen our cause for the long term. The easiest way to leave a legacy and impact Cornerstone in the future is a bequest. You can leave a percentage of your estate, a dollar amount of your life insurance, a piece of real estate, or a certain sum of money. Everyone can leave something behind…it does not require great wealth just a willing heart. Help us to fulfill Psalm 78:4 “…telling to the generation to come the praises of the Lord, and His strength and His wonderful works that he has done”. We believe that children are a legacy from God (Psalm 127:3) and it is our desire to protect the lives of the unborn and support the parents who nurture and care for them. How can we thank you if we don’t know? Perhaps you have already included Cornerstone in your will and estate planning. Would you let us know? What an encouragement to us that donors are passionate enough about our cause to consider our future in such a tangible way.